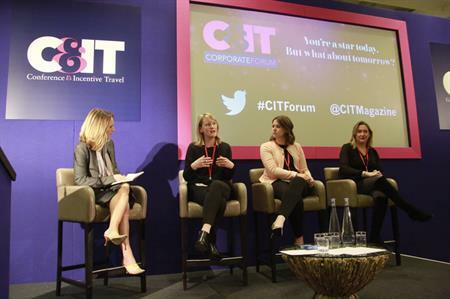 Planners from Barclays, Clarks and L'Oréal told delegates at C&IT Corporate Forum that catering to a diverse audience and celebrating individual achievement are key to success at annual conferences. "At L'Oréal, we’ve got multiple divisions and brands and they all like to have their own voice," said Alison Williams, head of events at L’Oréal. She added that in addition to outlining key sales messages across the wider group at conferences, the company had to separate the smaller divisions, to discuss the implications of these new messages and targets. "To promote positivity within our team, we ran an event with the theme 'you make a difference’, which was focussed on individuality," she explained. "The idea behind it was that it doesn’t matter what you do for the company, everyone plays a part. We weaved these themes through the content of the event during the day." According to Williams, understanding the audience is key. "You need to be sympathetic to who is in room and the demographic. For example, you could alienate an older audience with too much digital content." In addition to building brand loyalty, the ‘upside down pyramid’ effect, where all staff contributions are celebrated, makes employees feel valued. For Emma Stoker, vice president, personal and corporate banking events, Barclays, keeping up engagement before and after events is a vital part of brand loyalty. "One tool for us is storytelling. It means we can continue to distribute our messages after the event, and leading up to it. After an event we look at our Barclays sharing wall to see what's been talked about. We can also record video content to put on the intranet- that way people who weren't there can still take part virtually." As globalisation continues for corporate brands, integrating delegates from across the globe becomes ever more crucial. "We need to make sure we cater for different audiences," explained Lucy Hagen, group conference & events manager, C&J Clarks International. "For example, if people are flying in from Asia, we need to make sure they have enough breaks and that we don’t overwhelm them when they’re exhausted." She also emphasised the importance of good translation services, as many people don’t like to listen to a full day of content in a second language. "It can be tricky logistically. We’ve found it easy to get Spanish and German translation, but more difficult to find Korean or Chinese - the standard can vary hugely."